401 Merrimack St. Lowell, MA 01852 – Handicapped accessible entrance is located on the Colburn St. side of the building. Monday-Thursday 9 AM – 9 PM< Friday- Saturday 9 AM - 5 PM< Sunday: CLOSED **CLOSED Saturdays in summer (from Independence Day thru Labor Day weekends) View our closing dates. Take I-495 or Route 3 to the Lowell Connector. Take exit 5B to merge onto 3A N/Thorndike Street. Continue on Thorndike Street as it changes to Dutton Street. Turn left onto Market St. Turn right on Cardinal O’Connell Parkway. Turn left onto Merrimack Street. Library will be on the right—a large granite building with “Memorial Hall” etched in the side. 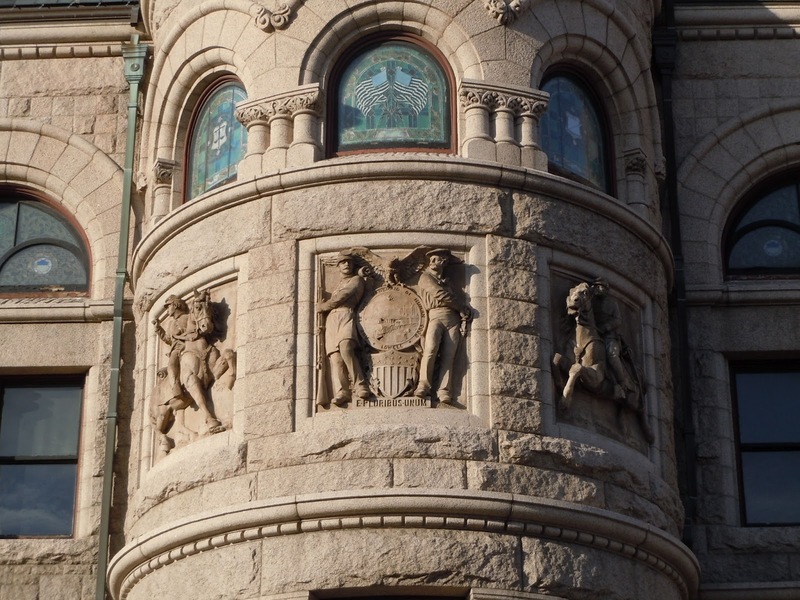 The library is next door to City Hall, another large granite building with a clock tower. 2-hour library parking lot on the corner of Moody and Colburn Streets (across from the Lowell Fire Station). To access this lot continue north on Merrimack Street following library parking signs. Turn right on Cabot Street. Turn right on Moody Street. The lot is at the very end of Moody Street as it turns onto Colburn Street. There are onstreet handicapped parking on Merrimack St. in front of the library and two 15 minute only spaces on Colburn Street in front of our handicapped entrance. On-street metered/kiosk parking available around the library. Meter/kiosk parking fees are in effect 8am-6pm Monday-Saturday. For longer visits to the library we recommend you park in one of the garages downtown. The garage closest to the library is the George Ayotte Parking Facility adjacent to the Tsongas Center. For more information about downtown parking and garages please visit the City of Lowell Parking Department. The library is adjacent to City Hall and is served by Lowell Regional Transit Authority on the following routes: Route 6 – Broadway/UMass Lowell; Route 7 – Pawtucketville/UMass Lowell North; Route 9 – Lowell Circulator. In addition, the continuously running Route 18 – Downtown Shuttle stops at nearby Dutton and Market Streets. Check the LRTA website for the most current information about routes, fares, and schedules. Take I-495 or Rte. 3 to the Lowell Connector. Stay on the Connector to exit 5B Thorndike St. Continue off the ramp down Thorndike St. Follow Thorndike St. past the Lowell Kennedy Center Transit Station and under twin overpasses of the Lord Overpass. Get into the left lane and turn left at the first light onto Fletcher St. (Dunkin Donuts will be on your left). Bear to the right and follow Fletcher street through one set of lights. Turn right into the parking lot for RiteAid. The Senior Center and the Council on Aging buildings are in the same complex as RiteAid. The Branch Library at the City of Lowell Senior Center houses a general recreational reading collection for seniors and the general public. Residents may borrow library materials at the branch using their Pollard Library card. Library cards may be obtained at the Main Library on 401 Merrimack Street, next to City Hall. Please visit our Library Cards and Loan Rules page for a full explanation of how to obtain a card and a list of our borrowing policies. The Branch Library includes six computers, a printer and a Library Computer Lab containing 11 computers and a printer. These machines and software were made possible due to a generous grant from the Bill and Melinda Gates Foundation. The six computers in the Branch Library are available from 9am-4pm Monday-Friday for Internet, electronic mail, and a variety of office programs (Word, Excel, Power Point, Publisher…). The computers in the Computer Lab are for computer trainings sponsored by the library and other community organizations. Computer trainings are open to adults of all ages. The trainings are currently made available through an LSTA grant administered by the Massachusetts Board of Library Commissioners given to the Pollard Memorial Library. For a current schedule of trainings please visit our Computer Classes page. We hope you enjoy the Branch Library and its offerings provided through this partnership. Please contact the Main Library with any comments or questions. Please call the main library number (978) 674-4120 if you need any assistance.